Need a fun, yet delicious dessert idea? 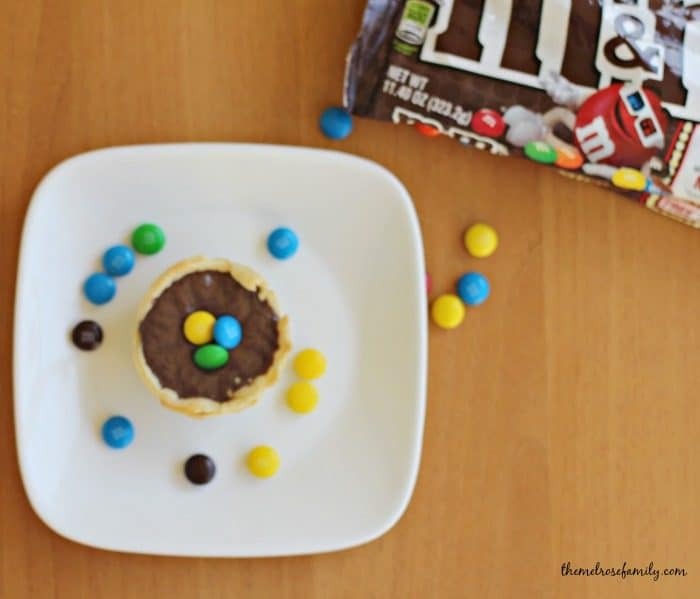 These Mini M&M Chocolate Fudge Pies are super easy and oh so good! Plus, they are the perfect dessert to get the kiddos involved in the creation. Not only is this dessert super easy, but the M&M crust is a little surprise that the kids love. My girls love M&Ms. Any time we try to give them incentive for doing something, like potty training, M&Ms are our go-to incentive. They are just the perfect little candy and I love to add them a dessert. 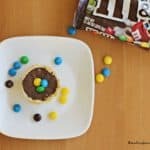 These mini M&M chocolate fudge pies are inspired by mom and my mother-in-law who both love their pie. I’m pretty sure that if the grandkids weren’t around they would both eat pie for breakfast. The great thing is that these pies are so easy and the perfect size for that. I use refrigerated pie crusts because they are easier to work with when shaping them in the cupcake tray. Once the pie crusts have baked for six minutes I get my girls involved in the process by having them fill the crusts with mini M&Ms. 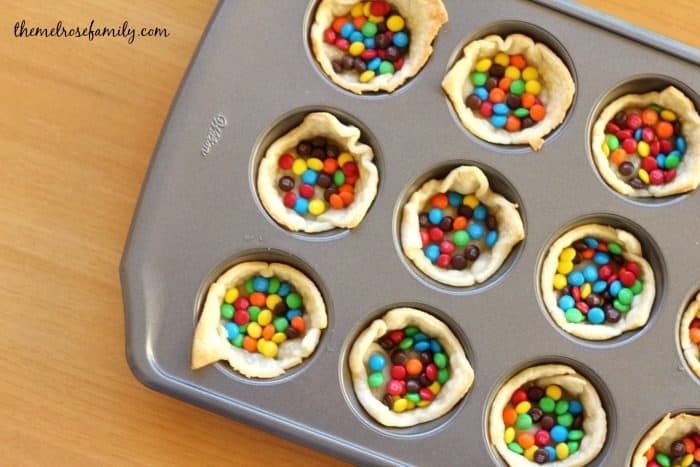 The M&Ms immediately start to melt into the pie crust, but to be sure I pop them back into the oven for two more minutes. My girls are great helpers and love turning their pies into rainbows. As you all know by now or have seen on SnapChat my youngest daughter is obsessed with rainbows. She’s usually dressed in some sort of rainbow so the idea of a rainbow dessert was right up her alley. Although, she was a bit disappointed that her rainbow disappeared. She was delighted when she bit into the pie and found it again. I personally love anything with chocolate, but when you combine chocolate fudge with M&Ms it’s a definite win. M&Ms are celebrating their 75th anniversary and we are excited to celebrate with them. You can find M&Ms at your local Kroger store and if you don’t have time to whip up these treats you can even pick up a fresh baked batch of M&M cookies in the bakery department. It’s a win-win! The combination of the chocolate fudge and the flaky M&M crust is a match made in heaven that no one can pass up. The finishing touch of M&Ms on top makes it the perfect dessert that everyone loves. Need a fun yet delicious dessert idea? 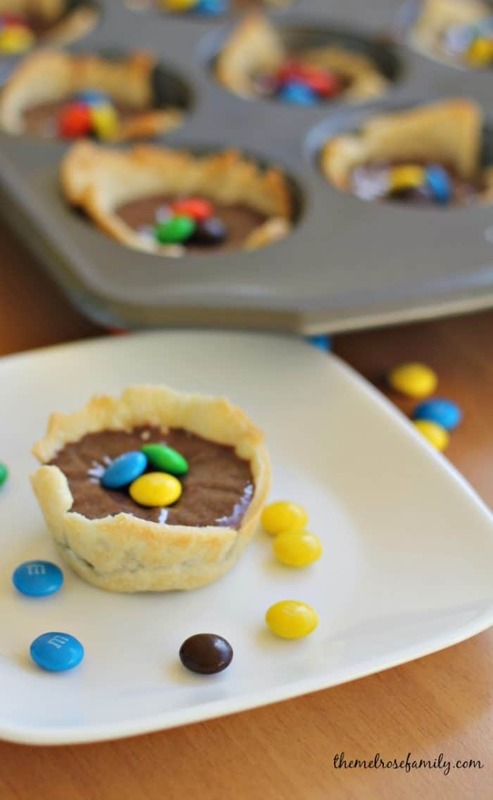 These Mini M&M Chocolate Fudge Pies are so easy that the kids can help and they are oh so good! Preheat the oven to 450 F and butter a cupcake tray. 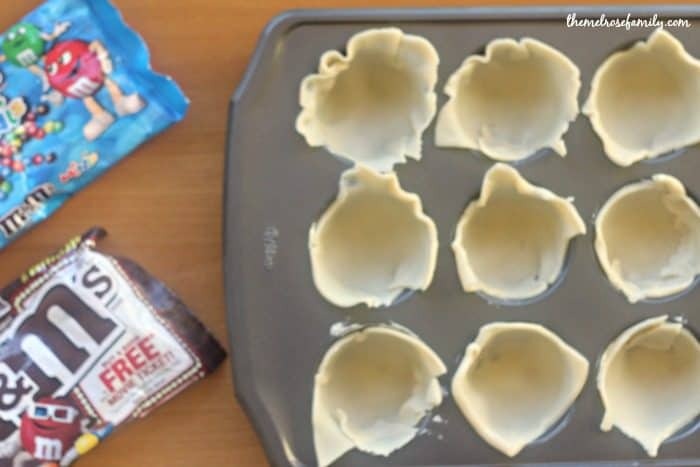 Cut out circles from the pie crust to fit into each cupcake. 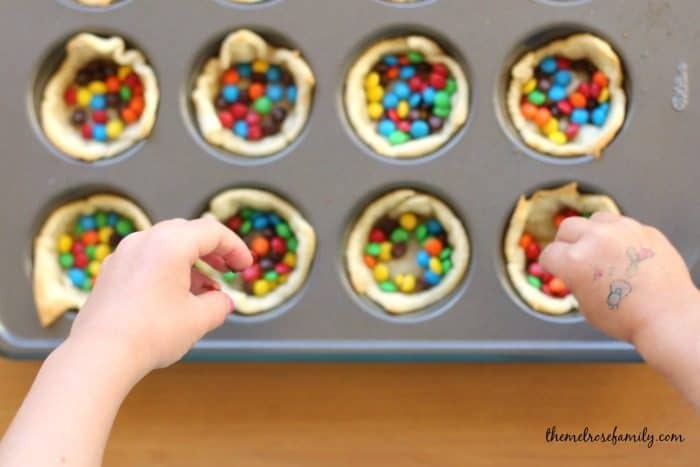 Bake the pie crusts for 6 minutes and pull out and fill with mini M&Ms. Place back in the oven for 2 minutes and then let cool for at least 15 minutes. In a saucepan melt the 6 oz of semi sweet chocolate and stir in the evaporated milk and remove from heat. Pour the chocolate mixture into the pie crusts and refrigerate for 4 hours. Once the chocolate fudge is solidified place M&Ms on top.